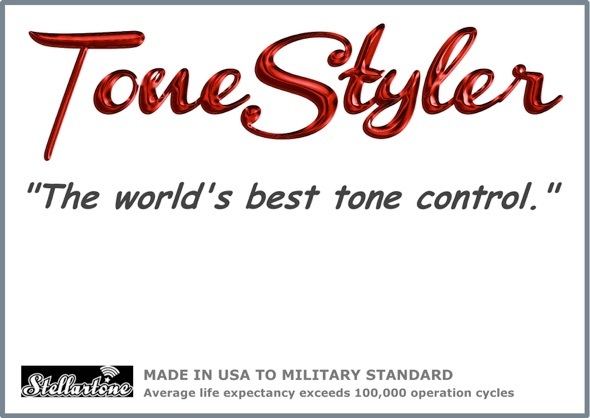 About the ToneStyler... and why you need one! 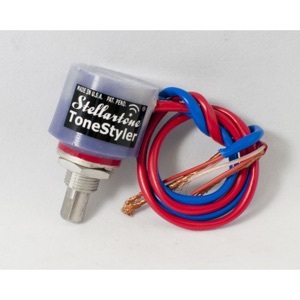 The ToneStyler® is an advanced drop-in replacement for the standard tone pots in electric guitars and basses. Easily installed in minutes without any modifications to the instrument, the ToneStyler dramatically improves the tone and versatility of any guitar or bass with passive pickups. 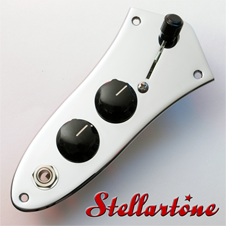 Plus, the ToneStyler fits your instrument's original tone knob, so your tone upgrade is invisible! Your old tone pot is a "low-pass filter"; it has only one capacitor, which offers only one roll‑off point, chosen just above the bass frequencies and string fundamental pitches. Due to this very simple design, passive tone pots act as "mid+treble volume controls"... reducing the loudness of all combined harmonics heard above the bass tones, all at the same time! To make matters worse, the tone pot's large value capacitor loads the pickups at all tone knob settings, which reduces your mid-range clarity and signal level. In sharp contrast, the revolutionary ToneStyler has not one, but an array of six to eleven selectable capacitors and roll-off points. For the first time, players can adjust the frequency of the roll-off point... not simply the combined loudness of all mids+highs! You choose how much treble to retain... how much mid-range to retain... and exactly where to cut these harmonics off. Plus, the ToneStyler's small value capacitors greatly reduce pickup loading; this noticeably boosts your guitar's clarity and output level. Powerful and precise control of treble & mid frequencies is provided at last... and that weak, muddy sound is completely eliminated! StellarTone introduces a unique concept in passive tone shaping with the StellarTone tonestyler's for bass and guitar. 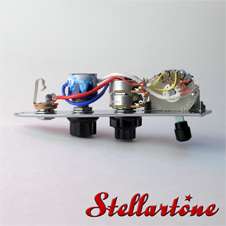 Designed and built in the US and utilising high quality Military Spec Rotary Switches with Gold Contacts and Terminals, low capacitance shielding, and a compact size the StellarTone tonestylers are a phenomenal product that builds on the high impedance passive analog tone characteristics of your current passive bass. These units for bass and guitar boast a quality analog designed circuit with zero noise, compression, distortion, or clipping of your signal and install cleanly in place of your current single capacitor tone control. These new BASS and STANDARD ToneStylers are offered with either six or ten EQ positions, and either our original single circuit design, or our new & unique dual pickup circuit with dual shielded cables and dual EQ ranges, individually optimised for neck & bridge pickup harmonics. The tone of each pickup is governed by an individual ToneStyler / tone control. This option gives you greater flexibility with the tone setting of each pickup. A combination of Bass 6 / 10 / 11 can be used. When you’re on stage, you may need only a few different tones from your bass guitar, and want to change the sound rapidly while playing. 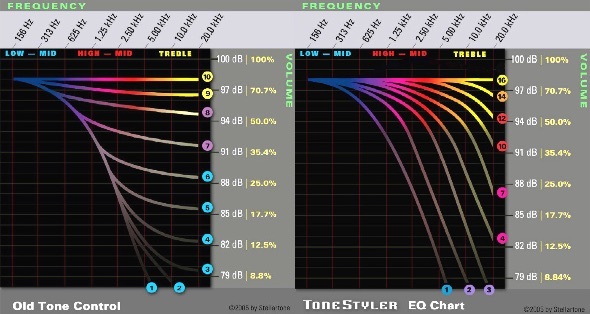 In this case you may prefer the simplicity of a 6-position ToneStyler. For studio work or recording, however, you’d probably opt for the greater range and finer graduation of tones between bright and dark of a 10- or 11-position ToneStyler. Incompatible with low-impedance, piezo or active pickups. The shafts do not fit coarse (18-spline) push-on plastic knobs. Item Codes ending with “-S” have a short shaft for set-screw knobs. Check your bass guitar first, unless you’re willing to change its knobs and are sure the shaft is long enough. 100% pure analogue high-impedance high-Q passive tone circuitry, with zero noise, distortion, compression or clipping. Heavy-duty sealed military-spec rotary switch with gold contacts and terminals. Low-profile colour-coded solid-cast metallized polymer modules require only 15/16" (23.813mm) depth inside the instrument's control compartment. 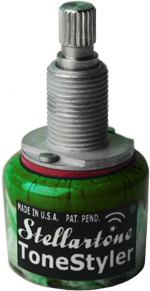 Compact cylindrical shape has the same 15/16" (23.813mm) diameter as a standard full-sized CTS potentiometer. 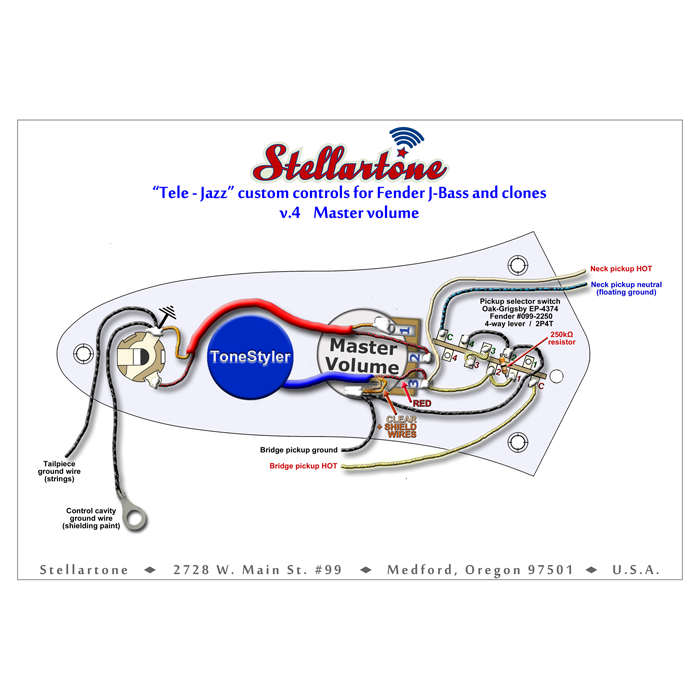 ToneStylers provide an easy, drop-in replacement of any standard tone pot with a 3/8" (9.525mm) diameter USA bushing; no modifications or routing required. The moulded-in colour-coded low-capacitance shielded cable provides a quick, simple connection: Just solder the cable directly to the input lug of a pickup volume or a master volume pot. No bass schematics required; all other controls and wiring remain unchanged. Complete with mounting hardware and instructions. Wired by hand in USA. Don't need any deep, sub-woofer tones? Choose a 'mid-range' ToneStyler GUITAR ELEVEN featuring a reduced .022μF EQ span. 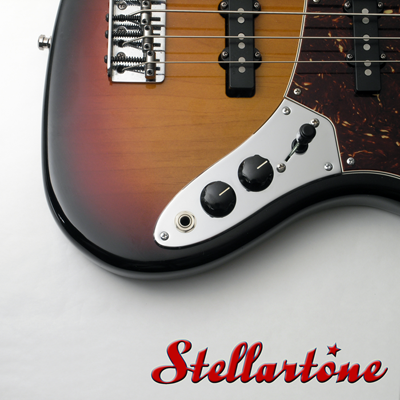 Choose the ToneStyler BASS DUO SIX SHORT to replace your .047μF tone pot. This unique DUO control retains Fender's original 'Volume-Volume-Tone' operation. Don't need any deep, sub-woofer tones? Choose a 'mid-range' ToneStyler GUITAR DUO SIX... or a GUITAR ELEVEN plus the master volume conversion... featuring reduced .022μF EQ spans. 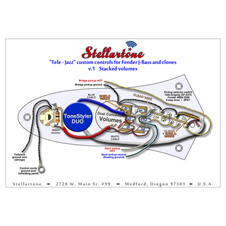 Choose the ToneStyler BASS DUO SIX to replace your .047μF tone pot. This unique DUO control retains Gibson's original 'Volume-Volume-Tone' operation. Choose one ToneStyler BASS TEN SHORT, BASS ELEVEN or BASS ELEVEN LEFTY to replace only one tone pot; choose two ToneStylers to replace both tone pots. Don't need any deep, sub-woofer tones? Choose a 'mid-range' ToneStyler GUITAR ELEVEN, featuring a reduced .022μF EQ span. Our recommendation for ultimate performance: a ToneStyler BASS for the neck pickup, plus a ToneStyler GUITAR for the bridge pickup! The stacked volume knobs function the same as the traditional separate volume knobs on Fender Jazz Basses: the small upper knob is the neck pickup's volume, and the lower ring knob is the bridge pickup's volume, Tone Styler Bass Duo 6 with .047uF and .022uF max cap ranges per pickup and the installers option of true bypass or tone pot loading circuits. The 4 way Telecaster switch provides instant pickup selection of: solo neck series, both series, both parallel, solo bridge. Best for high impedance pickups. Available with Gotoh Dome top metal knobs or classic Black Bakerlite Fender style knobs with chrome plate, or optional black plate. The stacked knobs provide two controls in the space of one. The small upper knob is the master volume, and the the lower ring knob is a traditional master tone knob. This arrangement is similar to the stacked volume/tone knobs introduced in 1960 in Fender's first J-Bass. 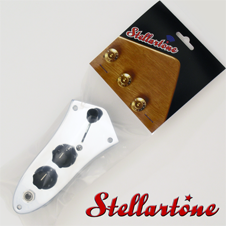 The third ToneStyler knob can be used independently, or concurrently with the standard tone control. The 4-way pickup selector switch allows instant changes between the soloed neck pickup, both in series, both in parallel, and the soloed bridge pickup. The "Tele-Jazz" version 2 assembly may be configured with either a ToneStyler BASS TEN or a TRIPLE SIX. The stacked knobs provide two controls in the space of one. The small upper knob is the master volume, and the the lower ring knob is a custom "tone depth" knob. This arrangement is similar to the stacked volume/tone knobs introduced in 1960 in Fender's first J-Bass... except in version 3, the "tone depth" ring knob affects all ToneStyler EQ positions, instead of affecting only one fixed tone cap, as in version 2. The "Tele-Jazz" version 3 assembly may be configured with either a ToneStyler BASS TEN or a TRIPLE SIX. Master volume knob, Tone Styler Bass Ten with .100uF max cap range, true bypass and a “virtual” tone pot loading circuit. The 4 way Telecaster switch provides instant pickup selection of: solo neck series, both series, both parallel, solo bridge. Best for high impedance pickups. Available with Gotoh Dome top metal knobs or classic Black Bakerlite Fender style knobs with chrome plate, or optional black plate. Master volume knob, Tone Styler Triple SIx with installers choice of either .022uF, .046uF or a .069uF max cap range and a true bypass or tone pot loading circuit option. The 4 way Telecaster switch provides instant pickup selection of: solo neck series, both series, both parallel, solo bridge. Best for high impedance pickups. Available with Gotoh Dome top metal knobs or classic Black Bakerlite Fender style knobs with chrome plate, or optional black plate. 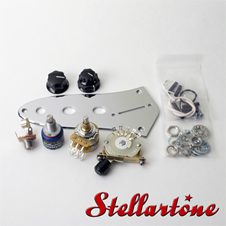 Stellartone's new "Tele-Jazz" control assemblies for the Fender J-Bass and clones offer premium-quality drop-in upgrades for the original J-Bass control plates, controls, and wiring plans. Four control plans are available either pre-wired or in kits, with a choice of knob styles and finishes. A "Tele-Jazz" upgrade will greatly expand the tonal range and versatility of your J-Bass, without any modifications or fitting required. 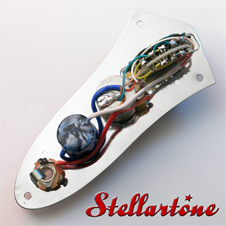 Stellartone's 100% passive hi-Z analog circuitry increases clarity and versatility, without adding any noise, hiss, distortion, clipping, limiting, or compression. No batteries! Hand-made in the U.S.A. The stacked volume knobs function the same as the traditional separate volume knobs on Fender Jazz Basses: the small upper knob is the neck pickup's volume, and the lower ring knob is the bridge pickup's volume. The 4-way pickup selector switch allows instant changes between the soloed neck pickup, both in series, both in parallel, and the soloed bridge pickup. Each pickup's loudness and your favorite blends are pre-set using the stacked volume knobs. In series mode, the small upper knob becomes the master volume. The ToneStyler BASS DUO SIX controls each pickup independently via contrasting EQ ranges for each pickup. In ToneStyler switch positions #1 - #5, the neck pickup's rolloff frequency begins about one octave lower than the bridge pickup's rolloff frequency. This voicing difference allows equal pickup loudness in each switch position. The "Tele-Jazz" version 1 assembly must be configured with a ToneStyler BASS DUO SIX. This simplified control plan is optimized for live performance uses. Pickup blending and separate volume controls have been eliminated via non-stacked master volume and master ToneStyler knobs, controlling the four most-distinctive and useful pickup selections. The "Tele-Jazz" version 4 assembly may be configured with either a ToneStyler BASS TEN or a TRIPLE SIX. The TRIPLE SIX is a six-position multi-use control, offering players the choice between three maximum capacitance ranges during installation. Starting from TRUE BYPASS (clockwise), choose .022µF GUITAR, .047µF BASS, or .069µF SUB-BASS as your maximum (counter-clockwise) EQ range when connecting our multi-wire shielded cable. Swap your tone pot with a ToneStyler TRIPLE SIX, listen to all three options... then decide how deep or how warm to configure your tone range. 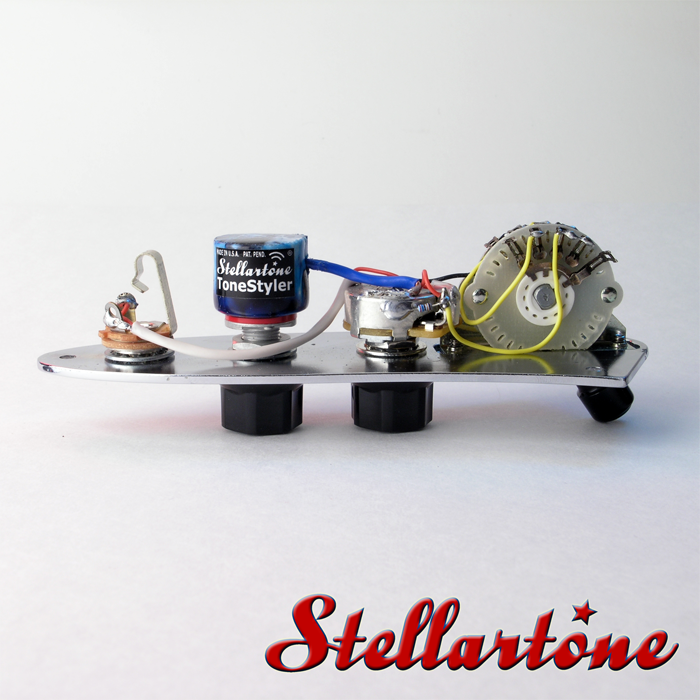 The Stellartone Bass Ten is a Ten-Position High-Impedance passive tone shaping circuit with zero noise, distortion, compression or clipping. The Bass Ten is recommended for pickguard/plate mounted controls on single pickup, two pickup instruments that utilize the correct type of no load blend control , or instruments with two tone controls. These units are intended to fit models with control plate, scratch plate, or pick guard control mounting that utilize 1/4"set screw knobs. 1Heavy-duty mil-spec rotary switches with gold contacts and terminals,made in the U.S.A. by Grayhill, Inc.
3U.S. 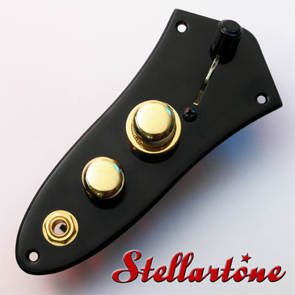 Standard 3/8"-32 diameter x 5/16" Mid-Length bushings, for mounting through instrument surfaces no thicker than 3/16"
The Stellartone Bass Eleven is a Eleven-Position High-Impedance passive tone shaping circuit with zero noise, distortion, compression or clipping. The Bass Eleven is recommended for single pickup instruments, two pickup instruments that utilize the correct type of no load blend control , or instruments with two tone controls that have controls mounted through the body. 20.235" Solid Splined shaft. Fits USA 24-Spline Push-On Knobs(Gibon®), 1/4" Set Screw knobs, or 6mm Knobs. 3U.S. Standard 3/8"-32 Diameter x 1/2" Mid-Length Bushing. 6-position rotary switch with 6 discrete tone circuits. Max capacitance .047µF. Flat bypass sonically duplicates a standard bass tone pot set to full clockwise. 30° detents. 1/4" (6.35mm) solid shaft with a "D" flat for secure mounting and non-slip "clocking" of a 1/4" (6.35mm) set-screw knob. 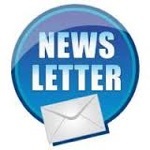 3/8"(9.525mm)-diameter (32tpi) x 5/16" (7.938mm) SHORT-length bushing for mounting through 3/8" (9.525mm) holes in plates, pick-guards and surfaces up to 3/16" (4.763mm) thick. These units are intended to fit models with through body installation that require larger bushing length. 2U.S 24-Spline solid shaft for most push on and set screw knobs. 3U.S. Standard 3/8"-32 diameter x 1/2"Mid-Length bushings, for mounting on through body controls. These units will fit instruments including Gibson Style (hard acrylic with 24-Spline hole) push on Speed, Bell, Top Hat, and Bonnet Style knobs, all brands of Fender style (hard plastic with smooth hole) push on Strat knobs, and all brands of set screw knobs with 1/4"or 6mm holes. Fits BC Rich, Breedlove, Brian May Guitars, Charvel, Cort, Daisy Rock, Danelectro, Dean, DiPinto, Epiphone, ESP, EVH, Fano, Fender, Fernandez, G&L, Gibson, Godin, Gretsch, Guild, Hagstrom, Ibanez, Jackson, Jay Turser, Koll, Kramer, MusicMan, Normandy, Parker, Peavey, PRS, Rickenbacker, Schecter, Squier, Steinberger, Taylor, Vox, Washburn, Yamaha, and many other fine guitars that use 24-Spline push on knobs, or 6mm or 1/4"set screw knobs. The tone of both pickups is governed by one tone knob, freeing the second knob for any other use. This option gives your bass guitar a greater overall range of resonance, because the bridge pickup’s tone circuits have a higher resonance range than the neck pickup’s. The tone of each pickup is governed by an individual ToneStyler / tone control. This option gives you greater flexibility with the tone setting of each pickup. A combination of Bass 6 / Bass 10 / Bass 11 can be used.